Tomatoes grow at Mastronardi's greenhouse operation in Coldwater. This article is one of a series of stories about Michigan’s agricultural economy. It is made possible with funding from the Michigan Department of Agriculture and Rural Development. It might be January, but that doesn't mean you can't enjoy homegrown Michigan produce. In fact, it could be as close as your neighborhood grocery aisle. Mastronardi Produce is a Canadian grower, headquartered in Kingsville, Ontario, that specializes in hydroponic greenhouse cultivation, a form of growing that makes use of mineral nutrient solutions instead of soil. Because it grows indoors, the company is able to offer its SUNSET brand of produce year-round at Michigan grocers like Meijer, Whole Foods, Aldi, Costco, Sam's Club, Trader Joe's, Walmart, and Target. What's more, since it operates a greenhouse in Coldwater, they're also able to provide consumers with Michigan-grown produce. The Coldwater facility supplies state retailers with SUNSET tomatoes, sweet bell peppers, and cucumbers, and during the chilly months it also grows its WOW (Wonders of Winter) line of strawberries. Due to its south central Michigan location, the Coldwater operation allows the grower to harvest, pack, and deliver its produce to customers throughout the Midwest in a timely fashion, often on the same day it's picked. Completed in 2014 (and operational since 2012), the 60-acre Coldwater facility is Mastronardi Produce's most state-of-the-art indoor growing operation. The greenhouse relies on a variety of technologies including grow lights (and LED research lighting) to control temperature, humidity, water, and light conditions, allowing for optimal crop growth. Automated harvest carts, and radio-frequency identification (RFID) tags are also used to increase efficiency and to keep track of produce. 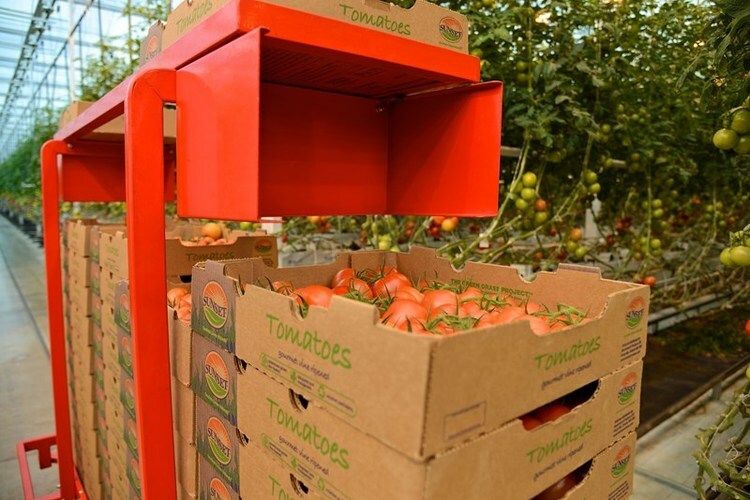 Robotic carts carrying full boxes of hand-picked tomatoes exit the Mastronardi Produce greenhouse before being placed in biodegradable packaging. 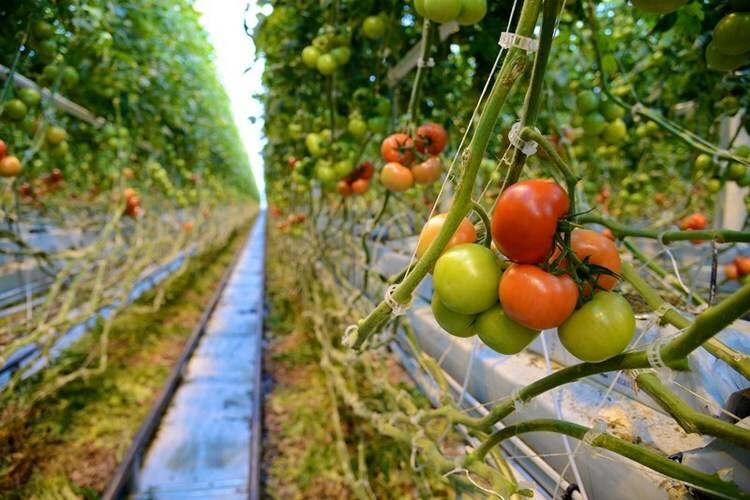 "Compared to field farming, greenhouse growing is much more efficient, yielding 12 to 20 times more produce in the same area," says Daniela Ferro, a spokesperson for Mastronardi Produce. "It also reduces water consumption drastically, and allows us to use natural, integrated pest management instead of chemical pesticides to manage any harmful insects. Of course, this also means that frigid Michigan winters won't harm our protected crop, so consumers can enjoy local produce all year long." In addition to providing consumers with Michigan produce, the company has also been a boon to the state's workforce, hiring local workers at all levels of employment at its Coldwater greenhouse and Livonia distribution center, the company's largest depot in North America. As for the relationship with the state's retailers, it's been a mutually beneficial one: the embrace of grocers has allowed the Coldwater operation to flourish while keeping store shelves stocked with the local produce their customers value. Due to the high interest in keeping things local, it's also worth noting that Mastronardi Produce goes the extra mile when it comes to guaranteeing where their fruits and vegetables come from. "Because we're greenhouse grown, we also have an enhanced food safety and traceability program, which allows us to trace product back to exactly where it came from," says Ferro. "Retailers have the satisfaction of knowing they're providing their consumers with safe, high-quality produce year-round." The Michigan-based grocery chain Meijer has been purchasing Mastronardi Produce for over 40 years and offers Michigan-grown tomatoes at each of its 230 stores, which are spread over six states. "Meijer offers our customers fresh, vine-ripened Michigan-grown tomatoes year-round, thanks to Mastronardi Produce's state-of-the-art hydroponic greenhouse in Coldwater," says Meijer spokesperson Christina Fecher. "We also offer locally-grown sweet peppers in colder months grown at that greenhouse." The grocery chain ensures that Mastronardi Produce and other growers meet their own high corporate standards by sending in a team of experienced buyers to check out their suppliers' farms and growing facilities. Keeping things local has been a priority for Meijer since the chain opened its first store in Greenville back in 1934. And the local produce options that the SUNSET line allows the grocer to offer are really appreciated by shoppers. "Not only is buying local produce the right thing to do, it's what our customers want and deserve," says Fecher. "Today, Meijer works with more than 125 local growers, which we define as growers within our six-state footprint. Of those, 92 are located in Michigan. We're also one of the largest purchasers of local produce in the markets we serve." Mastronardi Produce employees hand pick tomatoes on the vine from the Coldwater, Mich. greenhouse that Meijer customers can pick up from the produce department the next day. Peter Anastor, Director of the Agriculture Development Division at the Michigan Department of Agriculture and Rural Development (MDARD), has seen Mastronardi Produce's Coldwater facility and he's impressed. "Mastronardi is a driver of what's going on in Michigan as far as hydroponics," he says, "I think it's a good glimpse at what the potential future of agricultural growing is going to be." Right now, this type of indoor growing is only a small component of the state's agricultural economy; the only other facility that MDARD is regularly involved with is Kilbourn Produce, a family-owned hydroponic operation in Marshall, Michigan that grows red bell peppers. But the prospects are promising. Anastor thinks the attraction of locally grown produce, in terms of environmental sustainability and the desire to support Michigan jobs, combined with the efficiencies of hydroponic growing, like being able to control the growing conditions and harvest crops year-round, represent a wonderful economic opportunity. While the indoor ag industry is still in its early stages, MDARD has been talking with possible investors. For its part, Anastor says his agency is happy to talk to potential business operators and help connect them with prospective employees, identify a good location, and work with the MEDC and other state departments on permitting and incentives. And as technology makes the field more efficient, he expects interest in setting up new operations in the state will grow. "Looking out at the next decade, I think we're going to see more of this type of growing," says Anastor. "It's something we are keeping an eye on and are very interested in."